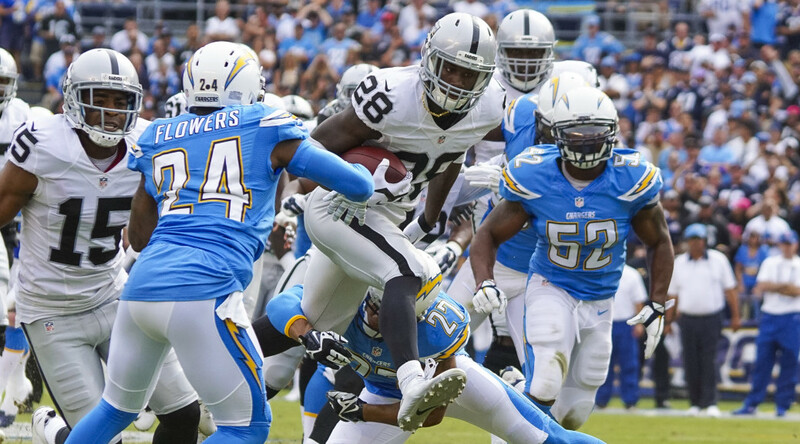 ALAMEDA, Calif. – Oakland Raiders RB Latavius Murray was named to his first Pro Bowl, the NFL announced Sunday. Murray, who was originally selected as an alternate, replaces Carolina Panthers RB Jonathan Stewart, who will be participating in the Super Bowl. Murray joins teammates S Charles Woodson, FB Marcel Reece, DE Khalil Mack, QB Derek Carr and WR Amari Cooper as selections to the NFL’s all-star game, to be played at Honolulu’s Aloha Stadium on Jan. 31. In December, Murray, Cooper and Carr and were named alternates for the Pro Bowl, and Carr and Cooper were named as replacements last week. The Raiders’ six Pro Bowl selections mark the team’s most since having six in 1994. The selections that season were WR/KR Tim Brown, G Kevin Gogan, QB Jeff Hostetler, CB Terry McDaniel, DT Chester McGlockton and G Steve Wisniewski. The most Pro Bowl representatives in franchise history came in 1973 and 1974 when the Raiders featured nine Pro Bowlers each year. Murray became the first Raider since 2010 to rush for 1,000 yards in a season, totaling 1,066 yards on 266 carries (4.0 avg.) and six touchdowns in 2015. His rushing total ranked sixth in the NFL and second among all AFC running backs. The third-year player also ranked third on the team with 41 receptions, totaling 232 yards. The 6-foot-3, 230-pound running back eclipsed the 100-yard mark twice during the campaign, racking up 139 yards on the ground in a Week 3 victory at Cleveland and posting a 113-yard effort in a Week 8 win over the New York Jets at home. He topped 70 yards rushing in a game on five other occasions during the year. The native of Nedrow, N.Y., was drafted by the Raiders in the sixth round (184th overall) of the 2013 NFL Draft out of UCF. He spent his rookie year on the reserve/injured list before playing in 15 games with three starts in 2014. He finished his second season with 82 carries for 424 yards and two touchdowns, leading the team with a 5.2-yard rushing average.